Remember that awesome festival I posted photos from early last summer? Well…Sonic Bloom IS BACK! And this year at an all new venue called the American Safari Ranch in South Park, CO! This new location is 75 mins from Denver and 90 mins from Boulder. The new venue looks awesome and features some incredible new perks like a car camping option, on site lodging packages, views of the continental divide, 360 panoramic mountain views, an indoor saloon with bar, games and DJ booth! As always the lineup is STACKED with some of the best electronic music producers in the game right now. The Road to Sonic Bloom festival tour is well under way with several remaining dates including the two I will be attending happening May 2nd & 3rd at Cervantes in Denver, CO.
What is really great about this event is that there are so many ways to get involved if you are interested in doing more than just attending. This year I am happy to announce that I am part of the Sonic Bloom festival street team! What this means is that I will be working hard to make sure that people from near and far know all about the festival. I will do this by handing out fliers and promoting on social media with a special emphasis on the awesome new location! I got this job by reaching out months in advance and requesting this position on the team. After meeting so many wonderful people at last years Sonic Bloom including my current boyfriend, and overall having one of the best weekends of my life, I am thrilled to promote Sonic Bloom Festival 2014. I hope to share with many how much this event changed my life. 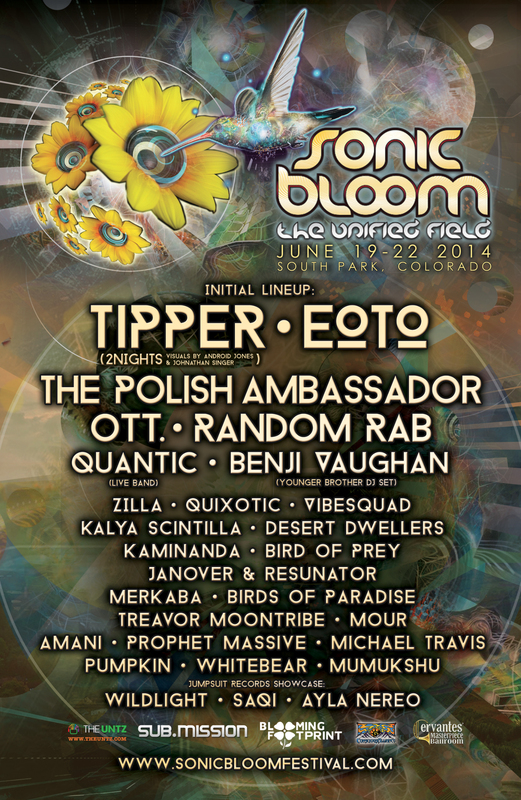 Most of all I hope to see everyone I know at Sonic Bloom 2014! If you live in Colorado I encourage you to get your tickets to The Unified Field official Sonic Bloom Pre- Party at Cervantes. This is a great way to meet and connect with people going to the festival as well as get a preview of some of the music you will hear!